At the funeral of his beloved grandfather, Josh Raines meets a man who introduces himself as his cousin Seth Lockwood. The Raines and the Lockwoods have a century of bad blood behind them, but Seth wants to bury the hatchet. The root of the enmity is a love triangle almost a century old. In the 1920s, Josh's great-grandfather Isaiah Lockwood, and his brother Seth both loved Eleanor Raines, a beautiful young actress. But when Eleanor rejected Seth's advances, he turned to a dark magic to steal her from this world. With the help of a stage magician who found a way to hide a slice of the world out of sync with our time line, Seth kept Eleanor imprisoned for decades. 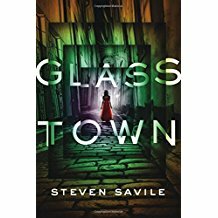 But now the walls of this "glass town" are collapsing, so Seth leaves his pocket world and steps into Josh's present, determined to repair Eleanor's prison and rejoin her there. Only Josh stands in his way. The prolific British author who writes for such popular franchises as Doctor Who makes an astoundingly inventive U.S. debut. VERDICT With a vivid London setting and a tantalizing dose of cinematic history (including Alfred Hitchcock's lost directorial debut), this dark fantasy should appeal to fans of Neil Gaiman.